When discussing Baseball Training Tips I always tell my coaches to stress to their players, everybody makes mistakes and if errors weren’t part of baseball, there wouldn’t be an official scorer. In the same breath I also emphasis physical mistakes are more acceptable than mental ones, as to muff a ball is one thing, but to forget how many outs there is in the inning, not so acceptable. As I said, regardless of skill level or age you’re playing or coaching, there will always be the same physical miscues, which occur in little league baseball, as there is in Major League Ball. Most of the time, the Only difference, between little league and the MLB, is how the player handles the situation after making a miscue. Let’s learn how to handle the most common errors. Not cleanly catching the 3rd strike on a batter is not that uncommon for any catcher, the pro due to the extreme breaking angles pitches take, the little leaguer, lack of experience. The main issue which must be taught here, is Don’t Panic, which is must easier said than done for some catchers, but must be accomplished, as Panic results in excessive hurrying, which leads to lack of thinking and coordination, which leads to errors. No different than any other learned skill, physically and mentally performing the skill in a repetitive method insures learning and executing the skill. (1.) 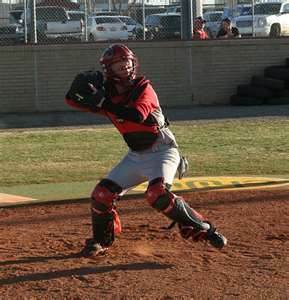 The catcher should be in Full gear and assume his normal crouching position behind the plate. (2.) The Coach should stand behind the Catcher, out of the catcher’s line of sight, as surprise, even though the player knows what’s coming, adds to the anxiety level which must be conquered. (4.) Upon hearing the coach yell “Ball” … The Catcher drops to his knees in a blocking position, because he’ll normally either be blocking a ball in the dirt, or trying to pick the ball up off the ground from dropping it, quickly locate the baseball, retrieve the ball and throw the runner out at first base. (5.) This is the point the first baseman becomes involved and will direct the catcher by reading the location of the ball, which is usually out in front of the plate, and call “Inside!” indicating he wants the throw on the infield side of the base in order to avoid the runner. (6.) The catcher will calmly, but quickly, retrieve the ball, take 1 or 2 steps into the infield, while facing first base, crow hop and throw to first for the out. (7.) There are times the ball will skip into foul territory when blocked, which in this case the first baseman yells “Outside!” wanting the ball to be thrown from foul territory in order to avoid the base runner. This verbal direction by the first baseman not only assists the catcher know where the runner is running in relation to the foul line, but can also help him locate the ball, as he would not go into fair territory if the 1st baseman yells “outside” which indicates the ball is located in foul ground. (8.) I stress this point … Never throw the ball over the runner’s head to first base, as the ball will be blocked by the runner until it clears the top of his head, leaving the first baseman very little or NO time to locate and react to the ball. By practicing this drill over and over, the catcher becomes accustomed to the situation, develops confidence he can handle the situation without panicking and makes a possible bad miscue, a routine put out. Once the players are comfortable with getting the batter out at first base, step the pressure up a notch or two by performing a more complex variation of this drill, which assumes a runner on third base with less than two outs, when the 3rd strike is dropped. (1.) The drill begins somewhat the same, except the catcher starts in the “Ready Position” as opposed to the “Relaxed Position,” the coach is still out of sight, rolls or tosses the baseball and yells “Ball” for the exercise to commence. 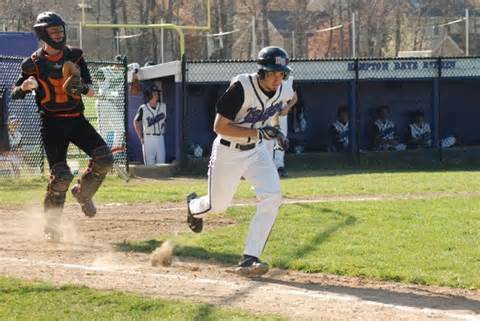 The first baseman locates and calls for the throw, the catcher retrieves the ball, and must obtain a firm grip on the ball before continuing. 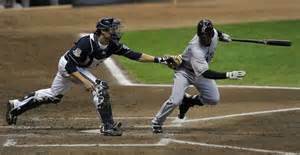 The reason for the firm grip is the catcher must first turn and Look The Runner Back to 3rd base, then turn and throw a chest high strike to the first baseman. Should he not have control of the ball it’s quite probable he’ll either drop it or make a bad throw. (2.) 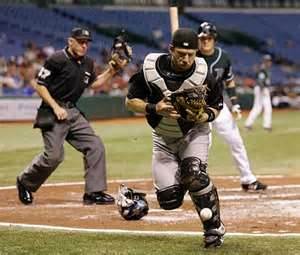 Does not matter where the ball ended up being fielded, the catcher is out of position, therefore after making the throw to first, he must immediately retreat to home plate and assume a defensive position, protecting the plate, and receive the throw back from the first baseman. (3.) Remind the catcher to locate the left field side of the plate with the heel of his shoe, which will tell him where he is without having to take his eyes off the baseball. (4.) Should the runner attempt to score after the throw, remind ALL of your infielders they should be yelling directions to the catcher, because he‘s watching the first baseman for the throw and is unable to see the runner, “He’s Coming!”...“He’s Coming!” so he can assume a defensive posture and not get blindsided by a violent collision.